TonerGreen Offers Eco-Friendly, Remanufactured Canon 131 Toner Cartridges | TonerGreen - Eco-Friendly Toners from the U.S.
TonerGreen, your leader in providing environmentally responsible printing solutions, is now offering Eco-Friendly Canon 131 Set of 4 Toner Cartridges at $158, a package of economical replacement printer cartridges for Canon LBP-7110 and Canon MF8280. It includes 273B001AA, 6272B001AA, 6271B001AA and 6270B001AA, which offer printing page capacities of up to 2,400 pages at 5% coverage for the black toner and 1,500 pages at 5% coverage for the color toners. 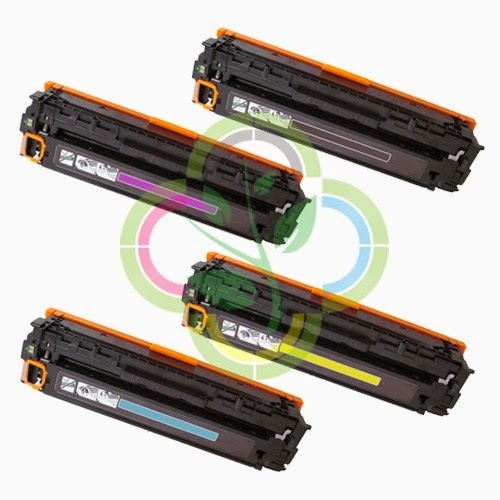 These replacement remanufactured Canon toner cartridges are thoroughly engineered to guarantee that it will work compatibly and perfectly with your Canon laser printers, producing the same quality printouts and page yield that meet or exceed the OEM specifications of Canon printer supplies. This Eco-Friendly Canon 131 Set of 4 Toner Cartridges is backed by 100% Risk-Free Guarantee and offers printer users with practical environmental solution, world-class service, and the highest quality toner cartridge offered at the most competitive price. This drum unit is fully assembled with expert technicians and all parts that are used are brand new. After its production, this drum cartridge goes into a stringent of quality control tests that are monitored by engineers and experienced technicians who are on-hand to monitor the effectiveness of production process. TonerGreen eco-friendly remanufactured Canon toner cartridges are refurbished used/empty OEM Canon toners and are sold to the market as alternative replacement cartridges. These are refurbished or recycled thus they connote the term “eco-friendly” and are recommended by go-green supporters to help save the environment from pollution caused when manufacturing new toner components such as lessening the amount of virgin materials used and reducing the numbers of empty printer cartridges that ends up in our landfills. We are driven by our steadfast commitment to consumer satisfaction that’s why all our remanufactured and compatible laser toner cartridges and ink cartridges are covered by our 2 Year Guarantee to stand by our products, while remaining confident in the superior performance of its remanufactured printer cartridges. We also assure you that using our drum cartridge will NOT void your printer warranty.